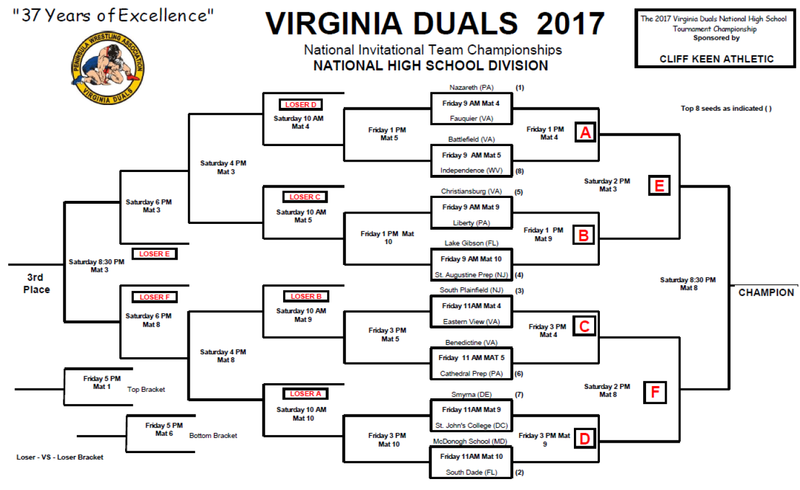 The 37th Virginia Duals hosted in Hampton Coliseum, Hampton VA brings on nationally ranked high school and college wrestlers and Elite teams from around the country each year. 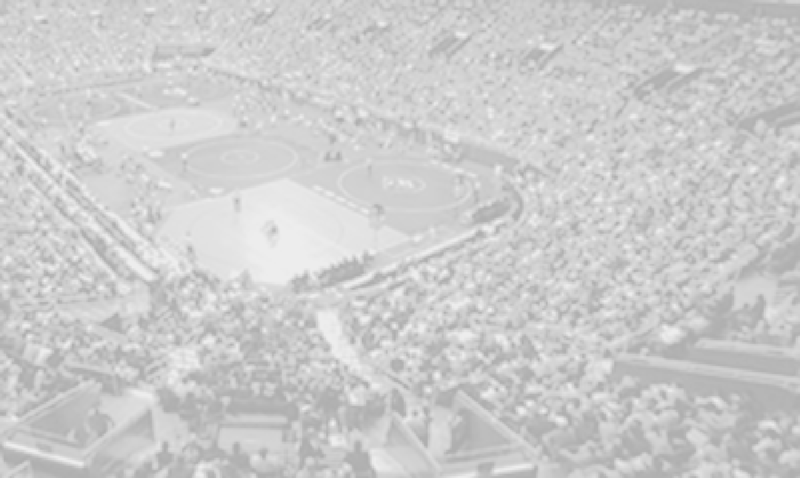 The make-up puts high school divisions into three 16 man brackets while the college teams having two different National brackets as all teams square off dueling to advance forward in each division to be named team Champion. 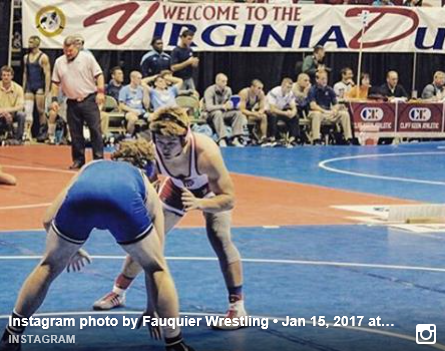 Wrestling at the Virginia Duals for 11 years has not been easy for team Fauquier, but as the Virginia Duals occurs midway through the season Fauquier always are up for this elite tourney. Holding a 20-22 all-time Virginia Dual record one must look at the Falcons wrestling in the National Div. bracket for the sixth time in those eleven years are once again showcased as one of Virginia’s best. As the Black and Blue Division consists mostly of Virginia mid-level schools the American and National Divisions always consists of better wrestling teams from around the East coast. As Fauquier being aligned with National ranked Nazareth HS. (PA) first round the Falcons then dueled Battlefield HS and Lake Gibson H.S (FL). “You want to wrestle the best” Coach Fisher states "but sometimes you bite the bear and sometimes the bear bites you.” As Fauquier may have been bit and falling in all three matches Coach Fisher must be pleased getting his entire squared mat time. Q: Any reflections you can say about the team’s performance while at the Virginia Duals? Coach Fisher: "This year more than any other, was a significant learning experience for our guys. It may have been like drinking from a fire hydrant for many of them, but it was a learning experience non the less. We were short-handed going in, and ended up even shorter-handed after. We were able to expose all of our guys to a tremendous wrestling environment and jv matches for the extra guys that we took. We had some great individual performances from a few of the guys, and others had a chance to see where they were in relation to top tier competition." Fauquier fell to Nazareth (PA) 53-21 in their opening round Friday morning, as the Falcons then faced off with foe Battlefield HS from Haymarket VA. Falling to the Bobcats 40-30, the final wrestling match had both teams coming off consecutive loses as Lake Gibson (FL) won the final match 63-9. Junior Franco Camarca went 2-0, Junior Kyle Budd and Freshmen Sam Fisher both posted a 2-1 record. What's Next: The Falcons will travel to Culpeper HS on Wednesday for a Tri meet with Culpeper HS and Charlottesville HS. Matches will start at 5PM.